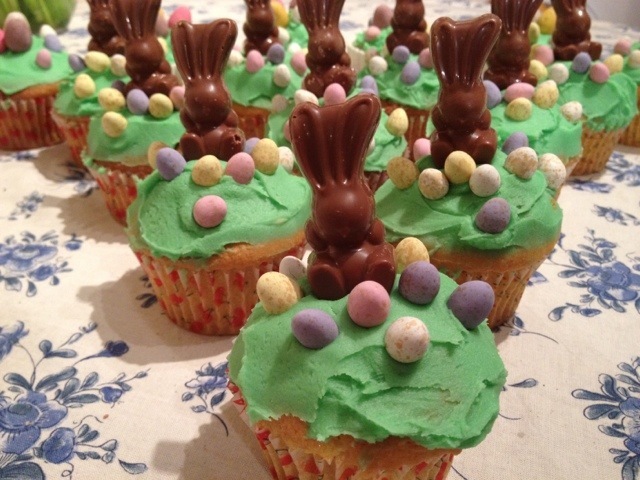 These aren’t a recipe but I have been waiting for months to make these and, as tomorrow is the last day I will be in the office before Easter, I had to make them today! The basic cupcake base is just my usual vanilla sponge (250g each of butter, sugar and self raising flour, 5 eggs and 1 tsp vanilla = 16 cupcakes) and the buttercream is also my regular vanilla but with the addition of green food colouring paste. The decorations are Malteser mini Malteaster bunnies and mini mini eggs, which are available from most supermarkets. These are just as cute as I had hoped so I just had to share them here, despite not really being a new recipe at all. Hope you all have a great Easter break! The Queen is visiting York on Thursday so I’ve taken the day off work to go see her. Yay, extra long weekend for me! What a cute decorating idea!